With millions of websites in operation, and thousands more being launched every day, it has become nearly impossible for smaller businesses to attract visitors without online advertising. You’re no longer competing only with similar businesses in your location, but globally too. And while even large brands were once sceptical about online advertising, Google’s AdWords and advertising on appropriate social media networks have both proven to be very powerful. With the right advertising strategy, you’re able to promote your business to people exactly when they’re looking for a business like yours, and to those who share demographics with your existing audience. But even if your ad hits the mark and people click on it, 96-98 percent of your visitors aren’t ready to buy: they’re only browsing, or researching. Another way of looking at it is that out of every 100 visitors to your site, only 2-4 of them with actually convert – and that includes those who clicked on one of your ads. Some might bookmark your site, and others may remember your business name. But if they’re anything like me, they can’t even remember where they put the car keys five minutes after getting home, so why should you count on them to remember your business when they’re ready to buy? Fortunately there is a way around this, a way to keep your business top-of-mind with past visitors to your website while they browse other websites, and to entice them into returning to your site, and hopefully converting. This can be achieved through retargeting – sometimes referred to as remarketing – and while the process can seem a little complicated at first, it is actually fairly easy to implement, and to benefit from. Even if you’re not familiar with what retargeting is, you would have been exposed to it already, just by browsing the internet, and using social media. You seen retargeting in action every time you have visited a website, or viewed certain products or services online, and then noticed ads for these products, services, or website brands when visiting other sites. At times it may feel like the brand is following you, and this isn’t too far from what is happening. The most common form of retargeting uses a retargeting pixel: a snippet of code that brands add to their websites or apps. When you visit a website with a retargeting pixel in place, it adds a cookie to your browser which begins anonymously tracking you. It is able to detect what pages you visit on the brand’s website, what products you view, and how much time you spend on each page. Once you navigate to another website, the cookie is able to continue tracking you, and your browsing behaviour, and this information is shared – anonymously – with advertising networks the brand uses. These networks can then ensure the brand’s ads are shown to you when you visit qualifying websites, keeping the brand and/or products you have viewed top-of-mind. With retargeting, brands have acknowledged and accepted that many customers aren’t ready to convert when they first visit a website. But instead of aggressively trying to get customers to convert before leaving a website, they settle for gently reminding you of the brand, and/or the products you looked at, via adverts on other websites. And sometimes the brand and/or products might even make an appearance in your social media feeds, even if you don’t follow that brand on any social networks. Apart from being less aggressive in the pursuit of a conversion, it also helps you target people who have shown some interest in your brand and/or products. With AdWords you’re able to ensure your ads are only shown to people who enter a search query containing any keywords you selected, reducing the chances of your ad being shown to someone with no interest in what you are selling. But even with powerful targeting features for display and social media advertising, you’re never entirely sure that your ad is shown to genuine prospects. Retargeting reduces this uncertainty, since your ads are now shown to people who have previously visited your website, and are therefore more likely to convert. Another form of retargeting is to use retargeting lists, which are lists of email addresses (and sometimes names) collected from your actual customers and prospects – through email subscriptions, account registrations, etc. These lists can be uploaded to the retargeting platform you are using (such as Facebook) and ensure that matching users see your ads. List based retargeting means you are even more sure that the people who see your ads are customers, or are interested in what you have to offer, but the best strategy for any business is to use both forms of retargeting. A negative aspect of retargeting lists is that some people have multiple email addresses, and the one they give you may not be the same one they use for social media. Now that you have a better understanding of what retargeting is, and what the purpose is, your next step would be to start using retargeting as part of your marketing strategy. As far as next steps go, it’s a smart one, and one I would recommend. Otherwise I wouldn’t have put together this guide. There are two primary goals when it comes to retargeting: awareness and conversions. There is value in both, so you don’t need to worry about choosing one of the other, but they both require a slightly different approach, and use different metrics to measure success. Awareness retargeting is the most basic form of retargeting, and also the one with the least defined segmenting. Often you will know nothing about the prospect other than they have visited your website, and viewed a few pages. They haven’t registered on your site, given you their details, or viewed any specific products. The purpose of an awareness campaign in retargeting is to obviously keep your brand fresh in the minds of past visitors to your site, while trying to get them to return to your site and either convert into a customer, or at the very least, move into your sales funnel, ready to start moving towards conversion. The creative assets for awareness campaigns should focus on emphasising your brand, and getting people to visit your site again. There shouldn’t be a hard sell attached – if they convert, great, but that isn’t the obvious goal. 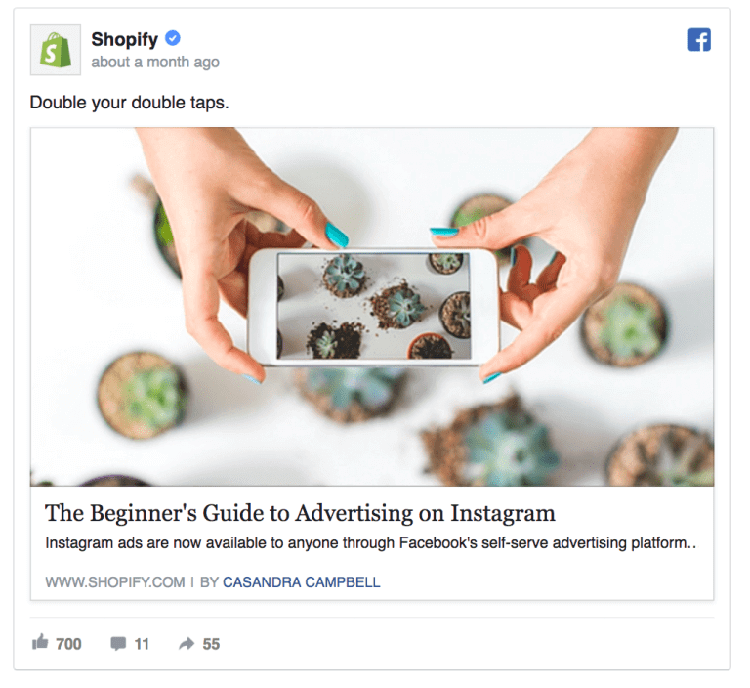 In the above example, Shopify isn’t trying to sell anything; clicking on the ad will take you to one of their blog posts about advertising on Instagram. But it does promote brand awareness, and can also be seen as helping to establish them as an authority: they’re an e-commerce platform, but they’re writing about advertising, which is an important component of running an e-commerce business. The metrics you will focus on are impressions, engagement (if displayed on a social network), and click-throughs. You should also be monitoring for visitors following an awareness ad and then converting, or moving into the conversion funnel, but that won’t be used to determine how successful an awareness retargeting campaign was. 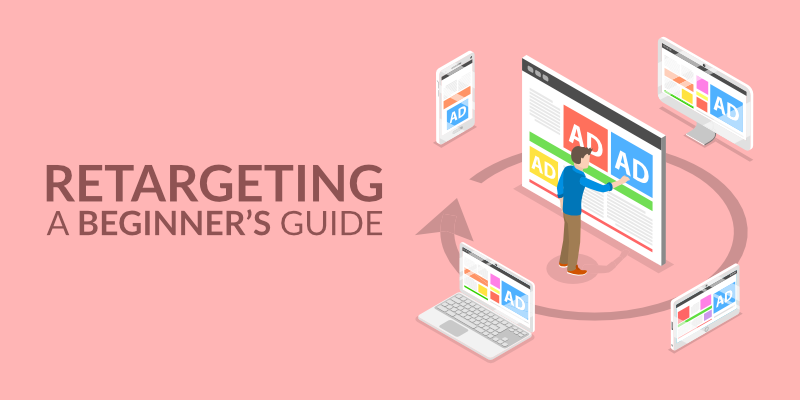 When retargeting for conversions, your campaigns – and creative assets – are focused on people who are aware of your brand, and have already taken some step towards converting. They’ve either given you some of their details in exchange for a regular newsletter, eBook, access to webinar, etc., or they’ve browsed through some of your online offerings – maybe even gone so far as to put one in their cart – but they haven’t bought anything, or taken the next conversion step. You know a little more about these prospects, and they know something about you, so your ads can be much more targeted: they can link back to specific products or services the prospect has looked at, or entice with a free trial. And that is actually a very important part of retargeting for conversions: the landing page the ads link to should be designed to support the goal of converting, or moving the prospect a step closer to converting. If they spent all their time on your site looking at ceramic teapots, and the retargeting ad they see – and click on – promotes your range of ceramic teapots, then the page they end up on should be for your ceramic teapots, not the main page of your e-commerce site. 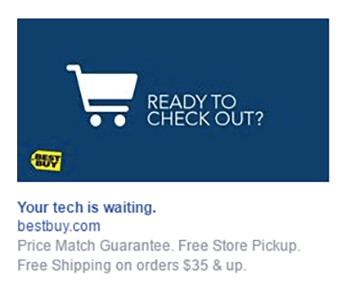 Best Buy cleverly uses retargeting for abandoned carts, with copy that highlights some of Best Buy’s benefits to customers. You may already use email to entice customers who have abandoned their cart back, but combining it with retargeting can help you reach customers who never open your email in the first place. The important metrics for conversion retargeting are click-through rates, form submissions, and cost-per-lead or cost-per-conversion. It is possible to set up retargeting campaigns on Google – and other display advertising networks – along with Facebook, Twitter, and LinkedIn. As with other marketing strategies, use the same networks and platforms that your audience is using. Google AdWords is obviously a must for any business, giving you access to YouTube too if your marketing strategy includes videos, with Facebook generally rounding off your retargeting strategy quite well. Twitter is useful if the platform is used by a large portion of your audience, while LinkedIn is great for B2B industries. 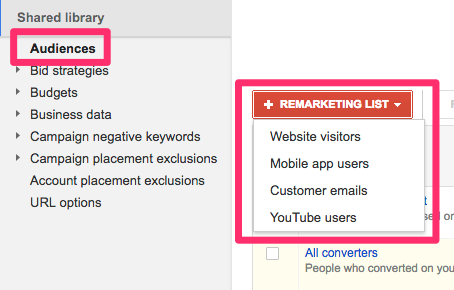 Now select Audiences, and then Set up remarketing for your chosen list source: website visitors, YouTube users, mobile app users, or customer emails you have collected. Give your list a unique name, and then select how to create your list from the set of predefined options. You can customise how your list is created by combining multiple options, thus making your campaign more targeted than just reaching visitors of a single page of your website. For display network ads, you can also set a membership duration limit, which defines how long each visitor ‘lives’ on your retargeting list. For conversion campaigns you would want to set a limit of between 60 and 90 days. A 30-day limit might see you missing visitors who take a little longer to convert, but you probably also aren’t interested in visitors who need more than 3-months to convert. You can modify this at any stage, so don’t be afraid to experiment a little to find the perfect duration for your audience. Enter your budget, then save and continue. The steps for setting up retargeting for YouTube and mobile app users are quite similar, but with different options for creating your lists. Dynamic retargeting is a little more complex to set up, but is an extremely powerful option for online retailers with a large catalogue of products. Dynamic retargeting makes it possible for the ads seen by visitors to include products and/or services they have previously viewed on your website, without you having to manually create each of the ads. If you find that retargeting works well for your business, it’s a good idea to broaden your audience and build out your lists with link retargeting. Link retargeting allows you to present ads to people who have shown an interest in your brand, without ever visiting your website. You can target ads at anyone who clicks on a URL that you control. This allows you to build out your retargeting audience much faster and capture anyone you’ve influenced on social media. With tools like Rebrandly, you can add retargeting pixels from Google AdWords or Facebook to your short links when sharing carefully chosen curated content – like news, reviews and media coverage related to your company. Then, you can direct relevant ads at anyone who has clicked them. Someone who’s read a great review about your business is more likely to convert, even if they’ve never interacted directly with your brand. In Ads Manager navigate to Menu >> Pixels, and give your pixel an appropriate name. 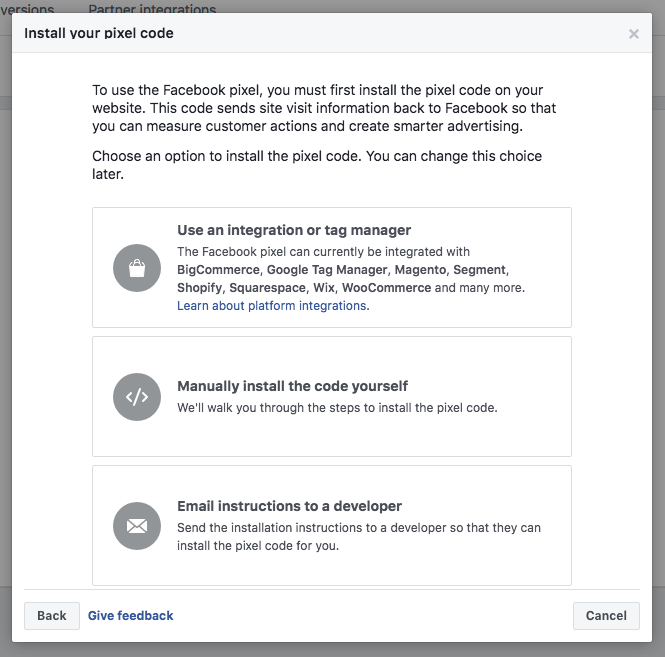 You can then choose to use an integration or tag manager – Facebook supports top e-commerce platforms and Google Tag Manager – or you can choose to add the pixel code to your site manually. The Basic pixel code doesn’t allow you to track specific actions or events, only that someone visited your website. Switching to Recommended or Advanced allows you to monitor for specific behaviour on your website and to track users that match these behaviours. Events you can track include someone completing registration, adding products to a wishlist or cart, viewing specific content, etc. Retargeting is always more powerful when it attached to specific events or actions, but what these events or actions are depends on your business, and the goals of your retargeting campaigns. 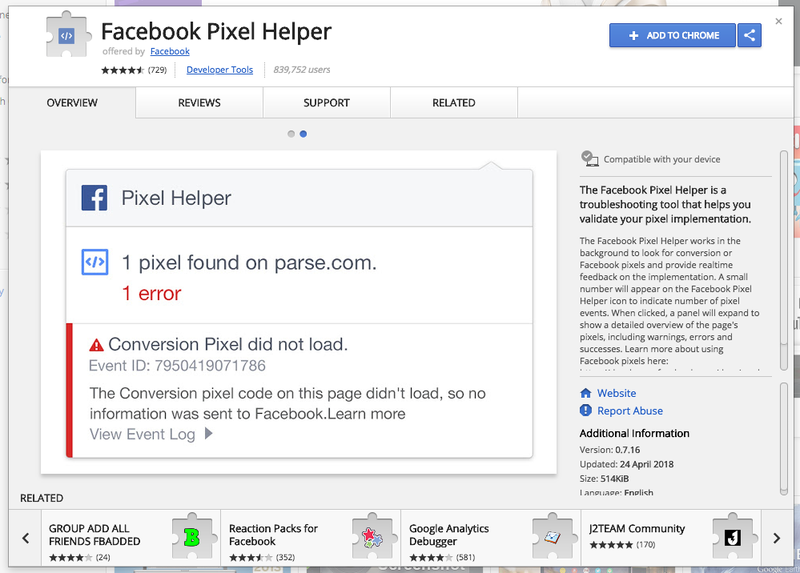 As with AdWords, once you have added the necessary code to the appropriate pages on your website, there is a Chrome extension you can use to check that it has been implemented properly and is working correctly. Once you are sure the pixel has been properly implemented, you will return to Ads Manager to create your audience. Select Menu >> Audience >> Create Audience >> Custom Audience. 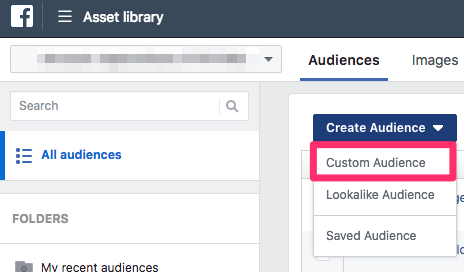 You can create an audience based on customer details you have collected and uploaded, website traffic, users of your app, or based on people who have engaged with your business on Facebook. For now we will focus on Website Traffic. You can either track all visitors, visitors to specific pages, or visitors by time spent on specific pages. You can also combine any of the options to create more focused targeting. You may get a warning that your audience is too small, but you can ignore this. 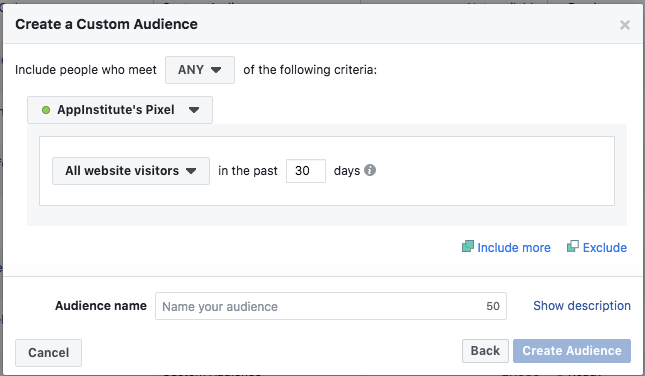 Facebook will continue monitoring your website audience, and start tracking and displaying your ads as soon as you exceed 20 visitors to your site since installing the Facebook pixel code. You can then proceed to creating your ads as you normally would, by first selecting an objective and then continuing with the steps that follow. As with Google AdWords, if you have a catalogue of products or services that visitors can buy online, you can set up dynamic ads by uploading a product feed as per Facebook’s guidelines. Facebook will then be able to dynamically generate product ads showing visitors products they have already viewed on your website, but not bought. You will also be able to define extra targeting parameters, along with setting placement parameters and your budget. Automatic placements is generally a safe option to choose, but if you find you have a need to only display the ad on certain devices, etc. you can configure this later. Remember though that by doing this you could severely limit the size of your audience. 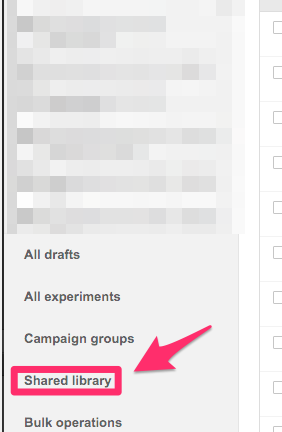 As noted earlier, you can also set up retargeting on Twitter and LinkedIn. You shouldn’t expect similar results to Google and Facebook with Twitter, but if it is a network favoured by your audience and visitors, it could be worth trying out. The nature of the LinkedIn network mean it is better suited to B2B industries. There are also a considerable number of dedicated retargeting services like AdRoll and Perfect Audience, both of which support retargeting across multiple networks and devices. While they will typically cost a bit more than running your own campaigns on Google and Facebook, they offer the advantage of a unified platform to access multiple networks, with the ability to manage your entire remarketing campaign from a single login. Retargeting has been around long enough, and used by large enough brands to help establish some best practices. Experimenting with a few lesser used approaches isn’t always a bad idea, since you never know what your particular audience will respond to. But unless properly controlled, experiments can also work out quite costly if they don’t generate any noticeable return. If you’re new to retargeting, stick to following established best practices until you have a solid understanding of how retargeting works, and what good results look like. Only then can you consider experimenting with different approaches, since you will be able to tell quite early whether or not any experiment is working, and be able to abandon it before it gobbles up too many resources. By behaviour – not all visitors to your site are interested in what you offer, and this is easily identified by looking at visitors who spend mere seconds on your site, and those who spend a fair amount of time, and even navigate to different pages. Retargeting the former would mostly be a waste of your resources, so weed them out and focus on those who display interest. You can segment further according to specific behaviour, such as the type of pages they visit, and how much time they spend on your site. 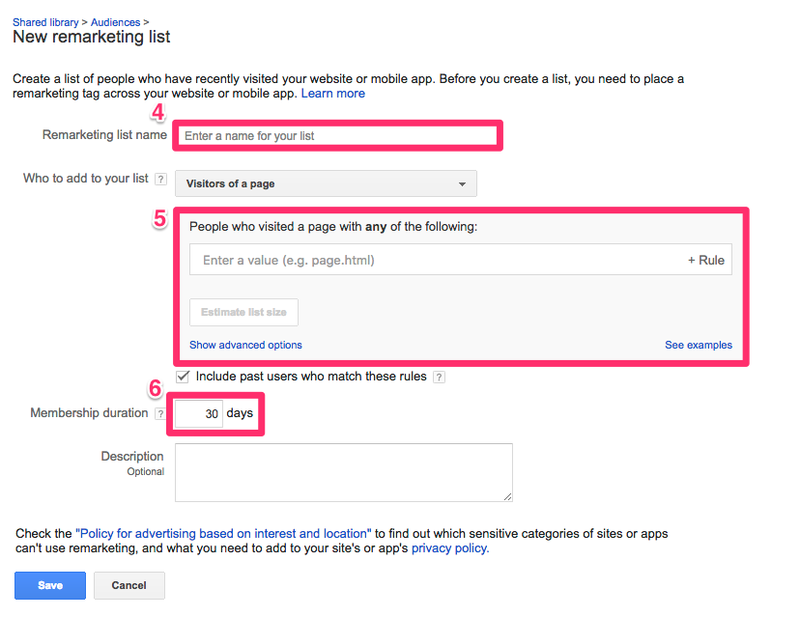 By time – Google AdWords allows you to set a limit for how long to keep retargeting a customer, and earlier I suggested you set this to between 60 and 90 days. But something else to consider is how much time do you want to pass between when a customer visits your site, and when they start seeing your ads? Seeing ads for your company very soon after visiting your site could negatively influence perception, but allowing too much time to pass could see customers forgetting who you are and what you do. Another factor to consider when it comes to time segmentation is how often customers see a particular ad; and seeing it too frequently is not necessarily a good thing. Try segmenting customers according to how long it has been since they visited your site; those who visited your site within the last seven days would see different messaging to those sitting at 30+ days, and they would also see your ads more frequently. Existing customers – you’d think that once a visitor has converted to a customer you wouldn’t have to bother with retargeting them, but you want to reach these customers occasionally with your awareness campaigns, to keep your brand and business top-of-mind. But you can also move existing customers over to conversion campaigns whenever you launch a new product or time-limited promotion that might interest them. Since they’re existing customers you may already be sending them marketing communications via email, but you could also create a list of any customers who either never open your email, or never click on any of the offers. With a bit of retargeting segmentation you could still reach these customers without being annoying. When a visitor converts, you don’t want to keep retargeting them – at least not with the same ads and creative that moved them to converting. To do this you need to either remove them from your retargeting lists, or move them over to your awareness retargeting campaign lists. The easiest way to do this is to have a burn code setup on any page that is displayed immediately after a conversion: a thank you page, or an order summary, something that is only ever seen after a visitor converts. A burn code is essentially the same as as your retargeting code, but when ‘fired’ it removes visitors from your retargeting lists, though you can set it up to move them to a new retargeting list too. An easy way to annoy your customers is to try and sell them something they have already bought from you, and a burn pixel eliminates this possibility. You can still retarget existing customers, but either with a brand awareness campaign, or by showing them new products related to what they have previously bought from you. Almost as bad as trying to sell the same product to a customer who has already converted, is showing them your ads too frequently. It’s annoying, and instead of moving them towards converting, it will most likely result in brand blindness. They see your ad so often that it eventually becomes invisible to them and they don’t even notice it anymore. Aim for a frequency cap of somewhere between 15 and 20 times in a 30-day period, and in keeping with the time segmentation guideline, decrease this frequency the further away a customer is from their original visit to your site. Using a retargeting services provider such as AdRoll or Perfect Audience does make running a retargeting campaign a little easier, but since they frequently use the same platforms and networks for advertising, using two different providers at the same time won’t make your campaign more effective. It will – however – make it more costly, since they could end up bidding against each other, driving up the cost of each impression. This also applies to using a retargeting service in conjunction with running your own campaigns manually using AdWords and Facebook. If you want to find out which is most effective, and therefor delivers the best return on investment, use one service for two to three months, before switching to another for the same period of time. That way you can see which service delivers the best results, without the cost being influenced by a competing service. Seeing the same ad over and over again leads to brand blindness in the same way as seeing an ad too frequently. There’s no need to create hundreds of different ads, but try to rotate between three and five different ads, all with the same goal. This is also a great way to work A/B testing into your retargeting strategy, allowing you to see what type of copy or message leads to better results. Three different ads used during a retargeting campaign run by Watchfinder. Note the differences in the copy, visuals, and the CTA. Your headline – which should be engaging, and relate to the visitors past interaction with your website. The visuals – whether you choose to use animated (video) or static visuals, as with your headline, it should be relevant to the message and the users interest. The call-to-action – this should be quite visible, and obvious. And again it should relate to the users interest, and personalised a bit in relation to their past visit. The ad copy – brief and to the point. Now is not the time for an essay. Ads on Facebook do give you more leeway in terms of how much copy you can include, but if it doesn’t grab their attention straight away, they’re not going to pause – and click. The linked landing page – the landing page each ad links to should be optimised in much the same way, but more importantly it must deliver exactly what the ad ‘promised’. For ads that promote a specific product, it should link to that product’s page. If it promotes an offer for a free eBook, the landing page must include a lead capture form for that offer, it shouldn’t require the visitor to first click on another link before getting to the capture form. and compare each of these points with the same on the ads that are performing. And remember you won’t always need to optimise each aspect of an underperforming ad. Even though dynamic ads are generated dynamically according to any products a visitors has viewed on your site, you would still need to provide some of the details that would be included in the ad, so optimisation of ads applies to dynamic retargeting too. Amazon is pretty good at cross selling products in their catalogue. Whenever you look at any product, you have a small carousel below it of items that customers bought together with the item you’re viewing. Admittedly the pairings are sometimes a little off, but you can do something similar with retargeting. Identify products in your catalogue that are frequently bought together, or that work together, and – using the burn code mentioned earlier – when a customer buys one item, shift them into a segment to promote a complementary product. But don’t show them ads for this until a week or two after they converted. 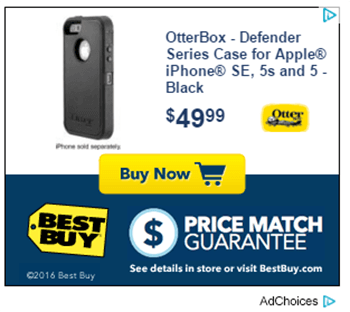 Another example of Best Buy’s retargeting, this time with a bit of cross selling of an iPhone cover shown to customers who recently bought a new iPhone. Up-selling usually works better for PaaS and SaaS products, where you are able to monitor when customers traditionally upgrade to a better package, and are able to display retargeting ads promoting upgrades to new customers after this time. Retargeting makes your online advertising more powerful, and more likely to deliver better results than traditional online advertising. However, it doesn’t replace the need for traditional advertising, which you use to reach customers who aren’t aware of your brand, nor does it replace the need for analysing results, monitoring return on investment, and identifying optimisation opportunities. And for beginners it can seem a little difficult to implement, but the effort can be worthwhile in terms of better conversions and brand awareness, and services like AdRoll and Perfect Audience can make it a little easier to get started with. Especially if you want to reach as large an audience as possible.